The Charlottesville Area is Pet Friendly! The Inn at Sugar Hollow Farm has pet friendly accommodations, and there is simply no shortage of pet friendly activities and venues in Charlottesville. After a long winter, I am sure you and your pets are ready to experience from fresh air and sunshine in the Virginia mountains! To stretch your legs and give your dog a some exercise, you may want to head out for a hike along one of our many mountain streams. At the end of Sugar Hollow Road, about 2 miles down from our bed and breakfast, check out the North Fork and South Fork trails of along the Moormans River. 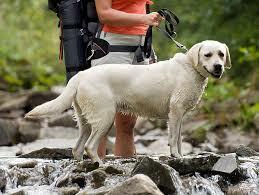 Crabtree Falls and the multitude of trails in the Shenandoah National Park are also excellent for people and pets. For a dog friendly winery, check out King Family Vineyards in nearby Crozet. With extensive outdoor seating and lots of room to run around and play fetch, I am sure your dog will have a chance to meet and make a new four legged friend. Most other vineyards in our area are designed with a nice patio with mountain views and enjoy having dogs take advantage of a day out in beautiful weather. I can't fail to mention Blue Mountain Brewery in nearby Afton, Virginia. This is one my favorite dog friendly lunch spots. The food is very good, specializing in gourmet style pizzas, and creative meatless Mondays. If you are craft beer fan, you'll enjoy the several options they have on tap. They have comfortable outdoor seating on their lawn with beautiful mountain views in the afternoon sun. If you want to take your dog into town, be sure to head to Charlottesville's Historic Downtown Pedestrian Mall. There you will find a blocks of brick paved, tree lined, car free space with outdoor pet friendly restaurant seating all along. Parking is easy to find in two large parking garages nearby and there are always many dogs parading up and down the mall with their owners or enjoying a seat at a park bench or on outdoor meal and many of the great restaurants along the way. So feel free to bring your dog along on your weekend getaway to Charlottesville, you won't have any trouble finding many experiences to share together! Older PostShould I Stay at a Bed and Breakfast? Sign up with your email address to receive our latest offers!